After breakfast I am met by my driver Steve and we head off for today's adventure. Steve is a wealth of knowledge and today I learn about the different ways of growing kiwi fruit amongst other things! I was ashamed to admit that I did not know if they grow on trees or bushes, now I am wiser..they grow on vines for those who are now wondering. We also discuss whether chocolate dipped cherries are as good for jetlag as fresh ones, for medicinal properties only of course, we try a box from a local chocolatier. As always, it is the people you meet that help make the days special and today is no exception - the jury is still out re the cherries though. First stop today is the Waitangi Treaty grounds. This is a must for anyone visiting the Bay of Islands as here you will learn about the events that shaped the nation as well as be able to visit the Treaty House. Remember to take your shoes off! There are cultural performances as well as guided tours to ensure you get the most out of your visit. The grounds are beautiful so allow yourself enough time to enjoy it. You will also see the largest carved war canoe (waka taua), Ngatokimatawhaorua, carved from a Kauri Tree. 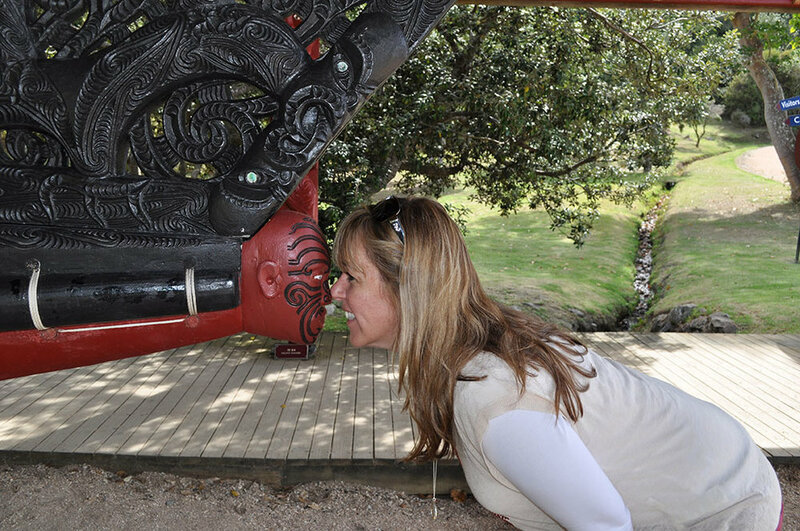 Say hello with a traditional Maori Greeting - the Hongi. If you happen to be there on 6th February you can join in the Waitangi Day celebrations when New Zealanders gather to celebrate the first signing of the treaty. Next stop, the Salt Air Heli pad to enjoy a bird's eye view of the Bay of Islands.